Barry Diller, left, and Angie Hicks. Barry Diller finally landed Angie's List. Consumer review and e-commerce site Angie's List (ANGI) has agreed to sell itself to online conglomerate IAC (IAC), a year and a half after it rebuffed its hostile bid for the company. 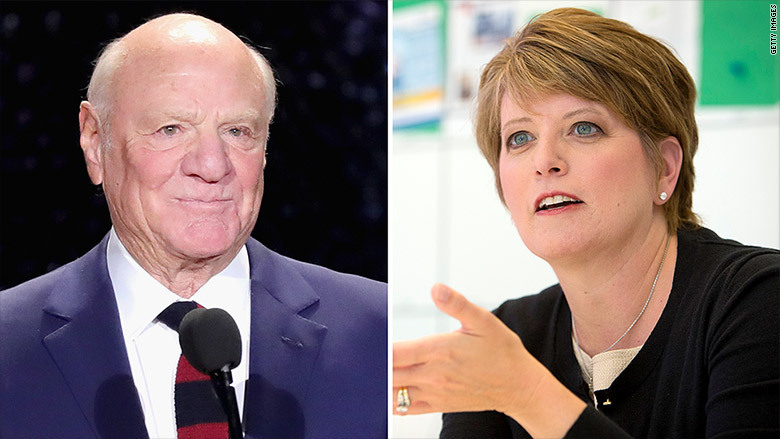 IAC, where Diller is chairman, made a hostile $512 million bid for Angie's List in November 2015 but was rebuffed. Angie's List said the bid "dramatically" too low. But the value of Angie's List stock has since plunged about 45% to a market value of about $350 million. The company lost nearly $8 million last year and is expected to post another quarterly loss on Wednesday. Under the deal announced Monday evening, Angie's List shareholders can elect to receive $8.50 in cash per share, or a share in the new combined company. It values the company at just over $500 million. Shares are up 3.5% after the deal was announced Monday evening. IAC also owns Angie's rival HomeAdvisor. It plans to continue to operate both brands separately, and combine them into a new publicly-traded company named ANGI Homeservices Inc. IAC will own at about 90% of the stock in the combined company. Both Angie's List and HomeAdvisor allow people to search for professionals providing services such as home repair. IAC also owns a majority of online dating service Match (MTCH), which itself owns Tinder, as well as video sharing site Vimeo and news sites such as The Daily Beast. It frequently buys companies, combines similar sites into the same holding company, and then spins them off. That's what it did with travel site Expedia (EXPE), which now owns numerous other travel sites. IAC has grown from one company with a market cap of $201 million in 1995 to a group of 10 different publicly traded companies with a market value of $43 billion, according to Diller, who is also chairman of Expedia. "While it's hard to predict the future, I think we'll just keep going," said Diller.